If you are using an Android mobile phone and the Spotify digital music App, you may have experienced some issues playing or stopping your music. We wanted to let you know that we have fixed this issue, so you can go back to enjoying your music while you ride. To all the lucky riders who love their sound quality and have decided to purchase the 45mm Audio Set, Sound by JBL you can now activate the JBL experience using the Cardo Connect App. Enjoy your new speakers! Bug fixes in music playing via a few models of mobile devices, so that everyone could enjoy the best audio quality, listening to their music. Did you ever get to change the system announce volume by mistake on standby mode? That was a bit confusing, right? We decided to cancel that option to avoid confusion.  You can easily change the system volume settings, by simply using the “Cardo Connect” App. You can now easily choose your language, using the “Cardo Connect” App. No need to use the community or choose regions anymore. Like always, some more bug fixes that will make your riding experience even better. Cardo Community page used for the Software update is currently not compatible with Safari browser. Please use one of these supported browsers; Chrome, FireFox, and Edge browsers are supported. Is my unit still under warranty? All Cardo units come with a 2-year warranty, starting from the date of purchase. Please keep your proof of purchase in order to reclaim your warranty. Your first point of warranty service is your dealer. How can I improve my sound quality? Sound quality is best when the speakers are placed directly opposite your ear canal. 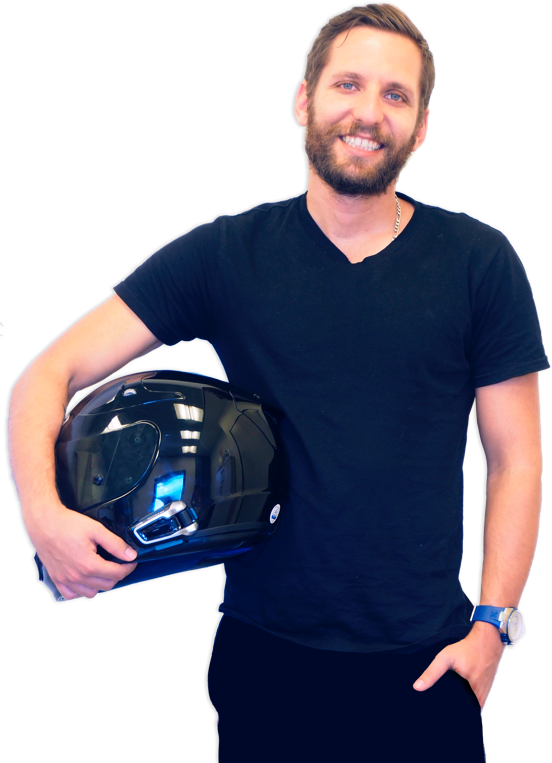 Verify that the speakers are correctly placed inside your helmet by following the next steps. 1. With the helmet on, slide your finger inside the helmet and press against the side of the helmet where your ear is. This is where the speakers should be positioned. 2. Remove the helmet, but keep your finger in that spot. Check to make sure the speakers are in this position. 3. Make sure the speakers are positioned as close to your ear as possible so you can feel them. 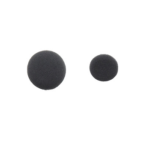 If necessary, use the included Velcro booster pads behind the speakers to get them closer to your ear. 4. Since every head is different, you may find that your helmet ear cavities are not placed optimally. If this is the case consider placing the speakers outside your helmet ear cavities right opposite your ears. How can I get more riding time out of my battery? 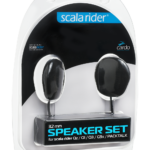 Your product comes with a Charge while riding feature that allows you to plug in the unit into the bike's 12V charger or a power bank, and continue riding long after the standard battery time has passed. In order to do it, just plug your unit into the power source – the unit will shut down. Turn it back on again and you're set. Which mobile app do I need to download for my device? 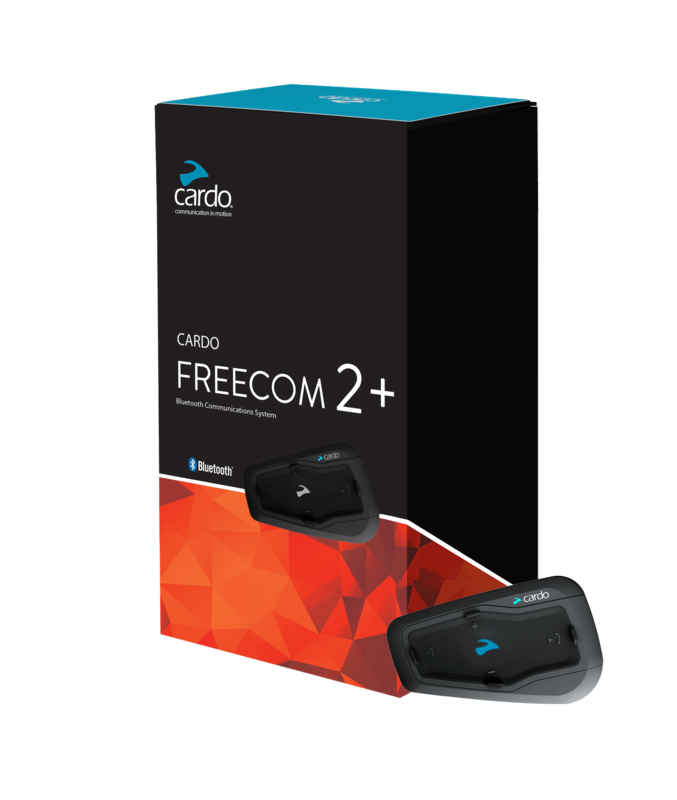 For PACTALK, PACTALK Bold, PACTALK Slim, SMARTPACK, SMARTH, FREECOM 1, FREECOM 2, and FREECOM 4 – you should get the new Cardo connect app (please note that in order to fully enjoy it's capabilities, you would need to upgrade your unit's firmware to the latest version. For Qz, Q1, Q3, G9, G9x, SRC V1.1, SRC Pro, Louis special edition, and SHO-1 – you should get the Cardo Smartset app (the Qz, Q1, G9 and SRC are only supported in Android). How do I make sure that my unit's battery lasts as long as possible? We recommend not to leave your unit unused or in storage for more than 3 months without charging. Be sure to plug your unit at least once every 3 months for full 4 hours to ensure maximum battery life. Is it possible to use it with my own earbuds / speakers? 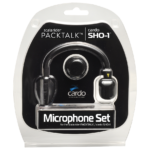 While your unit comes right out of the box with one of the best set of speakers in the business, you can always plug in your favorite earbuds or aftermarket speakers via the standard 3.5mm jack and ride on. Friends tell me my voice doesn’t come out clear. What can I do? If you are using a boom mic, make sure your mic is as close to your mouth as possible. 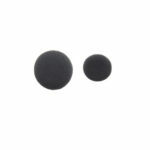 Search for the small yellow triangle near the boom and make sure it faces your mouth. 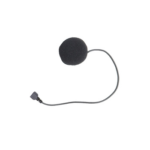 If the issue is noise from wind turbulence, put a larger mic sponge on the mic to help reduce it. 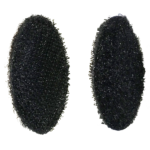 The larger sponge is included in your package accessories. 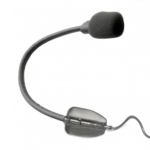 If you cannot find it you can purchase it as part of a replacement microphone. Plug in your unit to the charger and leave it charging for at least 4 hours straight. If this does not work, try using a different wall charger and USB cable. If the unit still doesn’t charge, please contact support. DO NOT attempt to disassemble or replace the battery on your own. DO NOT open the unit. It will no longer be waterproof! If your unit is out of warranty, you can find replacement batteries on 3rd party’s websites and in specialty electronics retailers. That said, we DO NOT recommend replacing parts on your own, for risk of water, dirt and general electronics damage. Unit not recognized by the Cardo community or can't update SW while unit is recognized. 1. Stop all running firewalls and anti-virus programs. 2. Start Google Chrome. 3. Login to http://community1.cardosystems.com/signup# 4. 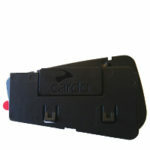 Plug in your Cardo device, ensuring your unit is turned off. LED should light in red. 5. Run Cardo Updater (install if not installed yet). 6. As soon as your unit has been recognized, Click on the SW update button. If at any time during the firmware upgrade, the Cardo updater stops, this would result in a code #D02 error. Should that happen, proceed with the following 1. Disconnect the unit from the computer 2. Wait 5 seconds and reconnect it 3. Click ok on the error message – this will restart the process In case you see the #D02 error again, proceed with the following: •	In your computer's task list, shut down the Cardo Updater •	Restart Google Chrome •	Repeat the process At this point, if you still can’t upgrade the FW, please try using a different USB cable or a different Computer. Mobile app doesn't recognize unit. What next? First, make sure that you are using the correct app – we have two different apps available for different product lines. If the issue is unresolved, make sure your smartphone is paired via Bluetooth and connected to the unit. Using a Smartwatch? Try turning it off before starting the app, and only then turn the smartwatch back on. If all above does not solve the issue, proceed with the following: 1. Delete the application from your phone 2. Delete the unit from the paired devices list in the phone's Bluetooth settings page 3. Restart the phone 4. Perform pairing (or factory) reset on the unit (as described in the troubleshooting section in the user manual) – the unit will turn off 5. Turn the unit back on 6. Pair the unit to the phone via Bluetooth 7. Download and install the app 8. Start the app If it still doesn’t connect, turn off your unit with the app running and switch it back on. In order to enjoy the best experience when using a smart system in parallel to a mobile phone we recommend connecting the unit in one of the 2 ways described below: 1. Use a latest model Bluetooth 5.0 equipped smartphone with a capability to be connected to 2 different devices. Connect your smartphone to both the bike system and the Cardo unit directly. 2. 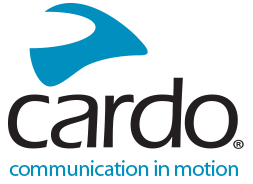 For all others, bypass the smart dashboard system by connecting both phone and the bike system directly to the Cardo unit (one on each channel) without connecting the phone to the bike system. How to use with a Smartwatch? Try turning it off before starting the app, and only then turn the smartwatch back on. 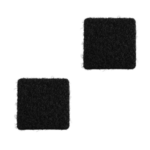 If the above does not solve the issue, proceed with the following: 1. Delete the application from your phone 2. Delete the unit from the paired devices list in the phone's Bluetooth settings page 3. Restart the phone 4. Perform pairing (or factory) reset on the unit (as described in the troubleshooting section in the user manual) – the unit will turn off 5. Turn the unit back on 6. Pair the unit to the phone via Bluetooth 7. Download and install the app 8. Start the app If it still doesn’t connect, turn off your unit with the app running and switch it back on. Why can't I get the full range of Intercom out of my unit? Can I use this product in the rain? Sure. All cardo units are IP67 waterproof. This means you can ride in the rain, and enjoy top communication. Yes. 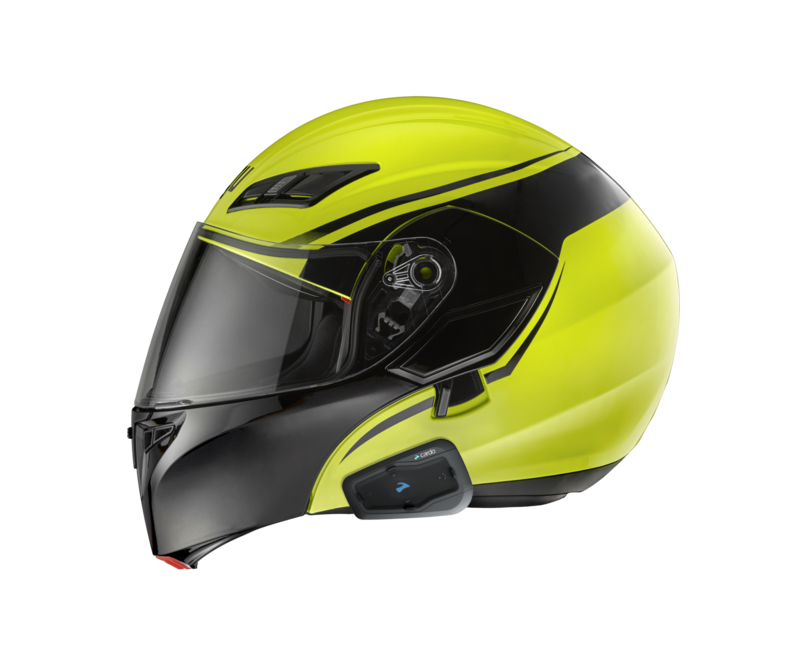 It can be fitted to virtually any helmet – Full face, dirt-bike, open face, 3/4, modular or half helmet. It would even fit on most ski helmets. 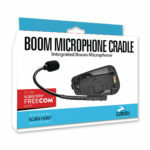 For installation on half helmets and ski helmets, you will need to purchase the Boom Microphone Cradle (a.k.a half helmet kit), sold separately. 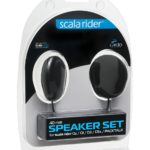 Compact speaker set for helmets with small ear cavities. A spare audio kit for moving the unit easly between helmets. 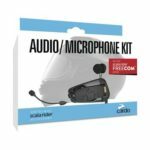 Includes cradle, microphones, 32mm speakers and all required mounting gear. Mounting cradle with an extra-long boom microphone for half halmets, ski helmets and other non-motorcyle helmets. 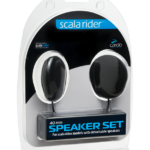 Places speakers closer to ears, improving volume level & sound quality. Get help by phone. Set up a repair or make a warranty claim. Contact us by email and get an answer in 2 working days. 12V MOTO CHARGER successfully added to your shopping bag. Sorry, we are currently unable to ship products to your country.